It’s not science fiction: it’s the new line of Slim Smart and GrandÓVita dryers designed by Candy to save space in the home and make life easier, so you can spend more time on the things that really count for you. We think small so you can do big things! “Slim” means exactly what it says: small size, large capacity. Up to 7 kg of laundry in a dryer only 46 cm deep, fully 12 cm less than standard Candy dryers, the only dryer that can be stacked on a 40 cm washing machine. The perfect way to enjoy all the convenience of a dryer even if you don’t have enough space in the home, while guaranteeing optimal results and energy savings! 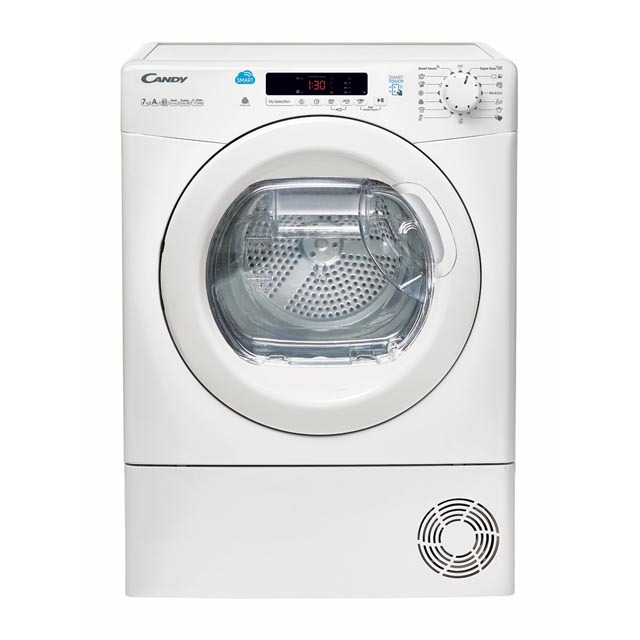 Here’s a dryer that will make you exclaim “it’s just too easy!”. The utmost comfort with a higher door, 3.5 cm higher than standard models, for minimum effort when you put laundry in and take it out, so you can forget all about backache! And that’s not all: Candy has patented EasyCase, the only truly easy water collection system. A tank of ergonomic shape, it is easy to remove after collecting water from the drying cycle directly through the door. More time for you and your family: cut folding and ironing time in half with the special alternating drum motion and a Smart sensor that maintains just the right moisture level (Super Easy Iron function). The Smart Delay function helps make your day easier by allowing you to delay the drying cycle by up to 24 hours and have it start it when most convenient for you. No need to break open the piggy-bank: save on electricity with energy class A+, heat pump technology to dry laundry while consuming less energy than a condensation dryer, and a Kilo Detector which uses special weight sensors to adjust the duration of the load cycle and save up to 70% on energy consumption. Reduced consumption means you can operate your dryer at the same time as the washing machine or other appliances. And finally, the EasyCase means you can reuse the water collected, for example by putting it in your iron or watering the plants. Slim Smart and GrandÓVita dryers pay attention to you and know your habits. The Memory function allows them to memorise your favourite programmes: when you find the perfect setting for your drying cycle, you can save it and reuse it whenever you want. The Smart Match function allows the dryer to communicate directly with the washing machine – provided it’s nearby, or stacked with the dryer, and connected to the same Wi-Fi network – to recognise the type of washing being done and suggest the best drying cycle for it. Long live your clothes, and your dryer! The wool programme with Woolmark approval is perfect for your clothes because the special drum movement and temperature control protects even the most delicate fabrics. The simply-Fi Candy app helps you keep the health of your dryer under control, monitoring the condition of filters, door closure, and the motor and offering practical advice for keeping it in efficient working order as long as possible.